Automakers are interested in producing high-quality aluminum from recycling due to forecasted increases in scrap production. The growing demand requires an aluminum minimill that can separate, clean, melt, and certify that alloy from scrap has the same quality as new. The scanning technology for identifying metal alloy pieces is used in the medical diagnostics industry, but it lacks the accuracy and automation necessary for this application. Likewise, food processors use high-volume sorters, but they have not been adapted for alloys. Melters exist that can perform the job, but not with the kind of autonomy necessary. Laser-induced breakdown spectroscopy (LIBS) can measure solid metal, but it had never been used to measure molten aluminum at a commercial plant prior to this project. These approaches have never been successfully integrated. The challenge is to do so cost effectively and to apply the technology to a very risk-averse industry. Sorter: First, a sorter divides aluminum scrap pieces (known as “twitch”) into individual alloy bins. The ERCo team’s original effort was suitable for heavy metals such as copper, but AIM needs an accurate and cost-effective sorter for aluminum alloy scrap. ERCo is integrating the sorter from UHV Technologies, another ARPA-E METALS performer, which uses X-ray fluorescence detectors to auto-sort aluminum alloys. UHV is providing ERCo with a pilot sorter for AIM integration in 2018. Vertical floatation de-coater (VFD): ERCo’s VFD unit then uses aerodynamics and conventional heat transfer to remove organic impurities such as oil or paint from a given alloy. High velocity gas flows simultaneously separate and heat scrap pieces to de-coat materials at lower temperatures than other techniques. This system can produce 99% organic-free metal scrap material that requires no further treatment—a major improvement over the more traditional techniques of oil dissolution and flame pyrolysis. 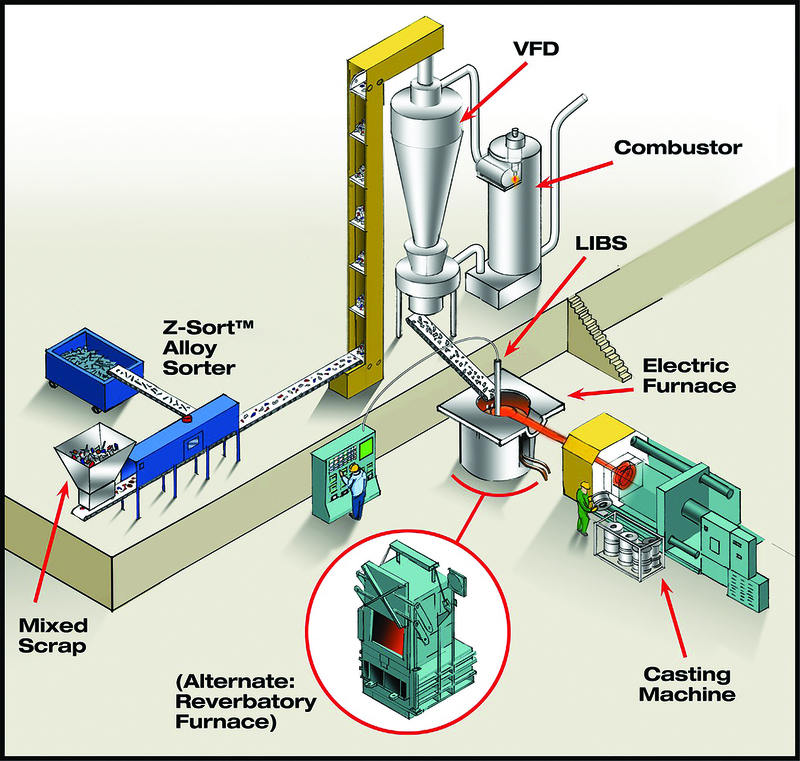 Figure 1: Diagram of ERCo’s aluminum integrated minimill: the world’s first system capable of reclaiming virgin-like aluminum alloy from scrap at manufacturing sites. Melter: Once the scrap is cleaned, it is melted to be cast into a form that can either be transported or sold. AIM can be used with any melting equipment. While melting itself does not represent a technological innovation, melting alloy onsite for immediate use directly represents an energy savings of about 30%. OnSpec for melt chemistry measurements: Finally, a LIBS analysis unit (branded OnSpec) measures the chemical composition of molten aluminum in situ and in less than two minutes by a probe immersed in the molten metal. The plasma caused by an incident laser can quickly determine the melt’s exact composition, representing a greater than 50% energy savings over melting and certifying virgin metal ingot from a foundry. AIM’s collective improvements to the process are projected to save more than 80% of the energy needed to make aluminum products, compared to conventional methods. The OnSpec technology is the first of this project’s technical components to reach commercial maturity. VFD has also been well received in the industry. Six successful demonstrations of the OnSpec technology have been undertaken at commerical industrial plants, leading to licensing of the technology to Altek, a Pennsylvania-based manufactuerer of industrial test equipment. In addition, ERCo founded a joint venture, Melt Cognition, with several partners to further develop and commercialize the AIM system. ERCo has successfully raised about $1.8 million in follow-on funding, while Melt Cognition is raising funding to integrate the AIM components into a single pilot plant at a commercially operating aluminum processor. The AIM could reduce energy usage in the U.S. aluminum metal casting industry and repurpose the aluminum scrap streams for use by domestic industry, rather than have this valuable, energy-intensive product exported. If widely adopted by U.S. industry, AIM could eliminate more than 80% of the total energy required for aluminum production, increase metal yield, allow the use of lower cost scrap, and reduce wasted embodied energy in aluminum scrap. As of January 2018, the ERCo team’s project has generated three invention disclosures to ARPA-E. Three U.S. Patent and Trademark Office (PTO) patent applications have been filed on the disclosed inventions.